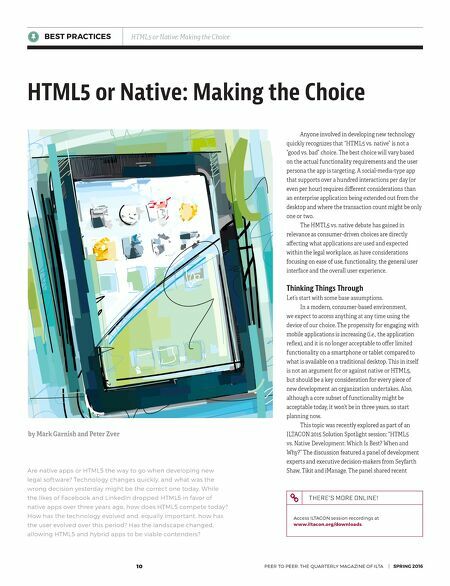 10 PEER TO PEER: THE QUARTERLY MAGAZINE OF ILTA | SPRING 2016 BEST PRACTICES HTML5 or Native: Making the Choice HTML5 or Native: Making the Choice Anyone involved in developing new technology quickly recognizes that "HTML5 vs. native" is not a "good vs. bad" choice. The best choice will vary based on the actual functionality requirements and the user persona the app is targeting. A social-media-type app that supports over a hundred interactions per day (or even per hour) requires different considerations than an enterprise application being extended out from the desktop and where the transaction count might be only one or two. 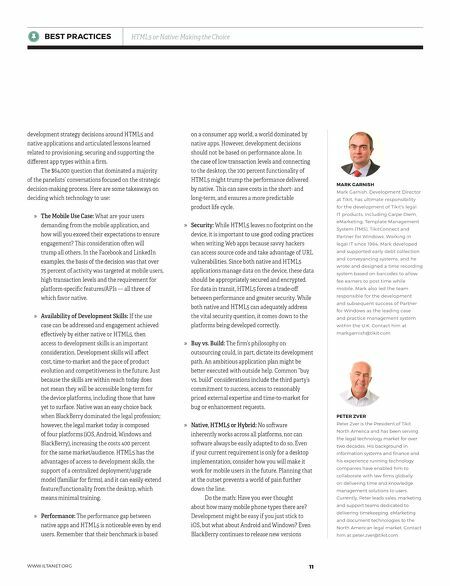 The HMTL5 vs. native debate has gained in relevance as consumer-driven choices are directly affecting what applications are used and expected within the legal workplace, as have considerations focusing on ease of use, functionality, the general user interface and the overall user experience. Thinking Things Through Let's start with some base assumptions. In a modern, consumer-based environment, we expect to access anything at any time using the device of our choice. The propensity for engaging with mobile applications is increasing (i.e., the application reflex), and it is no longer acceptable to offer limited functionality on a smartphone or tablet compared to what is available on a traditional desktop. This in itself is not an argument for or against native or HTML5, but should be a key consideration for every piece of new development an organization undertakes. Also, although a core subset of functionality might be acceptable today, it won't be in three years, so start planning now. This topic was recently explored as part of an ILTACON 2015 Solution Spotlight session: "HTML5 vs. Native Development: Which Is Best? When and Why?" The discussion featured a panel of development experts and executive decision-makers from Seyfarth Shaw, Tikit and iManage. The panel shared recent Are native apps or HTML5 the way to go when developing new legal software? Technology changes quickly, and what was the wrong decision yesterday might be the correct one today. While the likes of Facebook and LinkedIn dropped HTML5 in favor of native apps over three years ago, how does HTML5 compete today? How has the technology evolved and, equally important, how has the user evolved over this period? Has the landscape changed, allowing HTML5 and hybrid apps to be viable contenders? by Mark Garnish and Peter Zver THERE'S MORE ONLINE! Access ILTACON session recordings at www.iltacon.org/downloads.